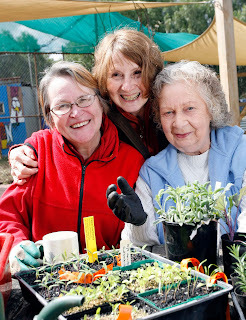 The PepperTree Community Nusery is a volunteer-powered, local green initiative bringing affordable, sustainably grown plants to the backyards, schools and community gardens of Moreland and beyond. Spring has Sprung and we have been preparing over 18 varieties of heirloom tomatoe seedlings for this moment: Saturday, Oct 1st from 10 - 12noon! Veggie seedlings, edible perennials, Australian Natives, spectacular succulents and plants for challenging spaces... we have a diverse range, including the "interesting and usual". This Swap Saturday at PepperTree Place includes the monthly Coburg Home-grown Edibles Swap along with offerings from the Cafe Cooperative (fresh baked goods and real coffee, by-donation) so come and bask in the sun, enjoy the gardens, snack on a carrot while sipping your coffee! Meet great people and help build a strong and vibrant garden community in Moreland.